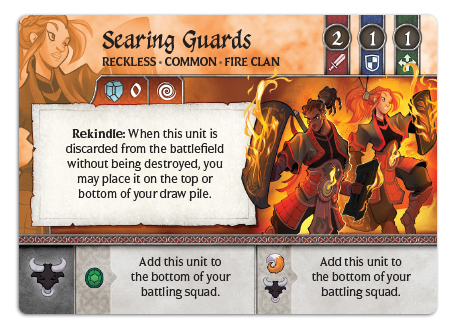 Hello, Crystal Clans fans! Welcome back to another series of previews for two awesome upcoming clans! If I were to tell you about a clan that had some really great stats, but carried one big drawback, you’d probably say, “Didn’t you already write about the Fang Clan?” And yes, yes I did. But we’re not here to talk about Fang today. Today is Fire Day. Prepare to meet the hottest deck in Crystal Clans! 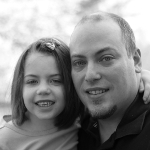 Let’s start with that really big drawback. Consume is the clan-specific ability of the Fire Clan and requires you, at the end of your turn, to discard the bottom unit from any squad led by a unit that has Consume. This even includes single unit squads! However, there is no requirement that a unit with Consume leads its squad, so you can avoid this penalty with some clever squad-building. So why then would you ever put a unit with Consume at the top of your squad? Because of abilities like this. Intense Burn is essentially an instant destruction of nearly every unit in the game. 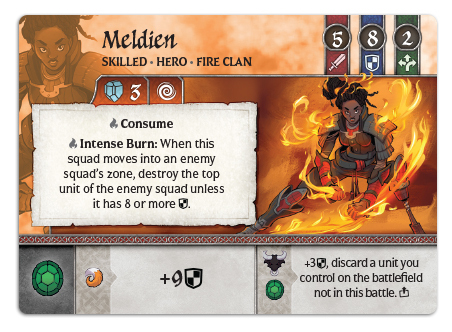 Opponents should be wary of having single unit squads, as Meldien can, for lack of a better term, melt right through them. But make sure you have a unit underneath Meldien in your squad, since you certainly don’t want to have his ability go up in smoke. Powerful abilities on units with Consume aren’t limited to just the heroes of Fire Clan. Common units get them too. 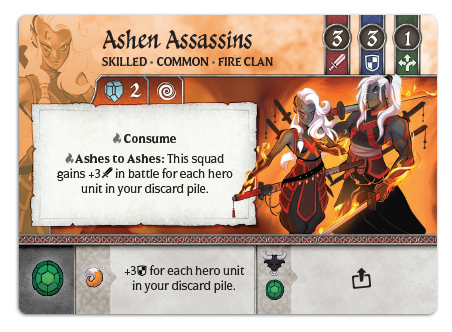 Ashen Assassins are quick, and reasonably priced for their stats, and due to Ashes to Ashes they have the potential to be one of the best common units in the game. If all of your hero units are in your discard pile, Ashen Assassins who lead a squad effectively have 12 attack! 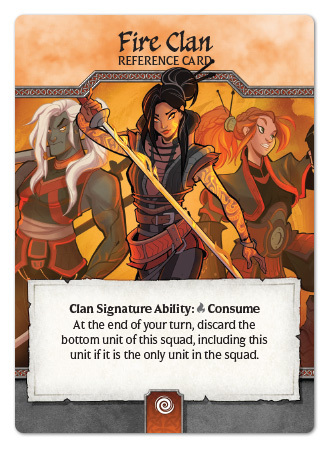 Not all units in the Fire Clan have the Consume ability - some units were made to be consumed. While Searing Guards don’t add much to a fighting force on their own, their ability essentially makes their numbers infinite. Additionally, with no cost to summon and quick movement, Searing Guards are excellent at securing empty crystal zones to help you setup a score. But Searing Guards shouldn’t just be used as a target for Consume. 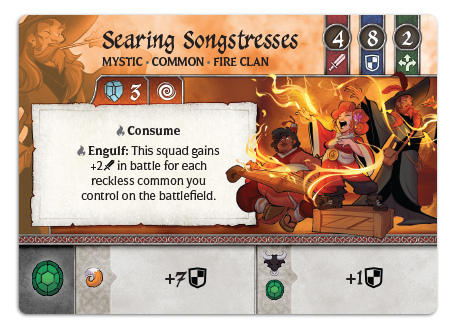 They also are instrumental to the Searing Songstresses, who gain strength for each Searing Guards unit on the battlefield. Like most musicians, these Searing Songstresses certainly love playing to a crowd. Hopefully you’re beginning to see that the Fire Clan does more than just sizzle. Join us next week as we meet balance of the Light Clan. Remember, both clans are available for preorder now!